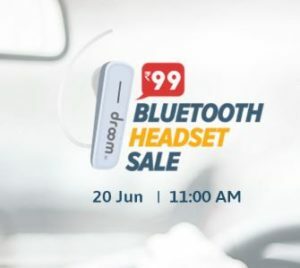 After offering ISI marked helmets for Rs.99 and Car perfumed for Rs.99, Droom is back with another loot offer today where they are offering The Bluetooth Headset for only Rs.99. Earlier I have already ordered one helmet at Rs.99 to check the genuineness and let me tell you, they are delivering the product at the said price with free delivery. Although The quality of the Helmet was little compromised, but with the offered price it’s quite good. Now in this post, I will tell you how to order the Bluetooth Headset at only Rs.99. You will get a reminder on your Mobile Number and Email from Droom before sale. VOila!! Bluetooth headset will be delivered in a week. Tips – It is recommended that you fill out your shipping details before the sale starts. As it will save a lot of time during High traffic when site might be unresponsive. All Bluetooth Headsets will be consisting of “doom.in” logo. This Deal will be Live on 20th June from 11 AM till 7 PM or until stocks last.